-Updated the current version 2.1 with few changes in right sized disks. Thanks to Cor van der Hulst - a blog visitor who gave some tips on right sized disk values. Future Updates: Working on right now is a Raid Group Size Calculator where the software will recommend the raid group size values for a given disk configuration. 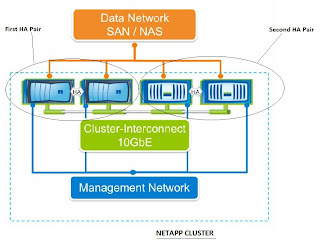 Personally I always get confused over these terms and with the Cluster Mode of NetApp it becomes even more confusing. This post is just to clarify the basics on the terminology used. An HA pair consists of 2 identical controllers; each controller actively provides data services and has redundant cabled paths to the other controller’s disk storage. If either controller is down for any planned or unplanned reason, its HA partner can take over its storage and maintain access to the data. When the downed system rejoins the cluster, the partner will give back the storage resources. Olden day meaning of Cluster: The term cluster has been used historically to refer to an HA pair running Data ONTAP 7G or 7-Mode. But not anymore. 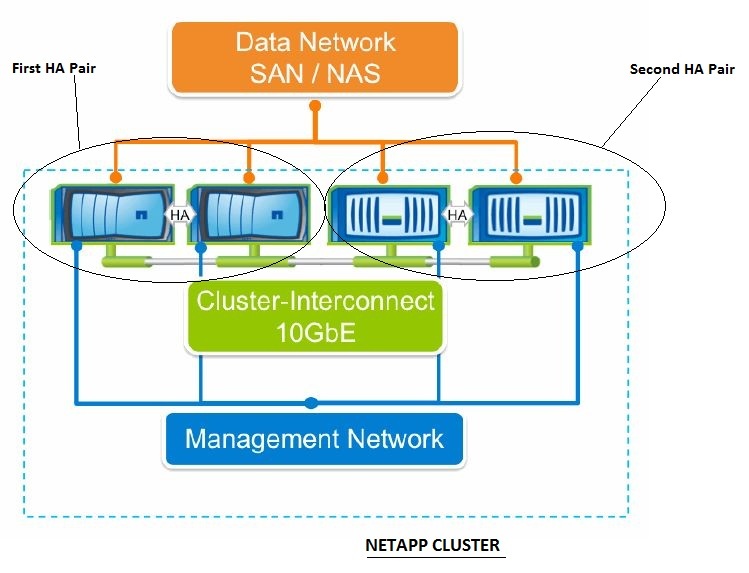 The term cluster now refers only to a configuration of one or more HA pairs running clustered Data ONTAP. 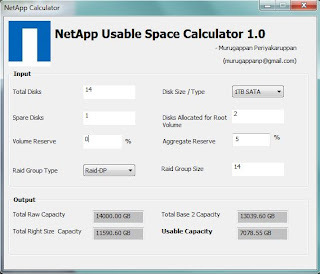 There are 2 variants of NetApp ONTAP ﻿operating systems. 2) Cluster Mode or C-Mode or the new name Clustered Data ONTAP. 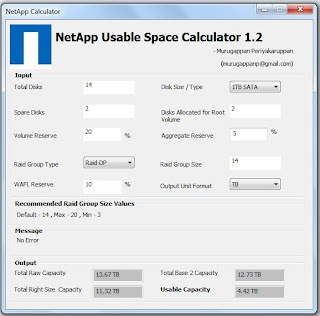 For people who are looking at a quick way to calculate the usable space of a NetApp Filer, I have developed this tool. It is a stand alone executable (Approx 2 MB) which will run on Windows platforms. No Installation needed. I understand there may be bugs in the tool. I am ready for feedback and would like to improve this tool. For now please download and use and let me know. Please use this tool as a estimate and this tool is supplied without any warranty. It may not report accurate sizes. 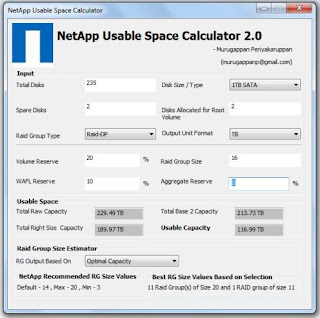 Many people have blogged about the usable calculation formula. I am not going to repeat the steps here. Instead I will give some pointers to those blogs. Below info was used in developing this calculator. Feedback recommended. Basically if you go to bestbuy and pick a 1TB drive, you actually think that you store 1TB of pictures and music. Thats not the truth. Storage hardware is using the base 10 system and software is using the base 2 system. So no storage is actually lost, it is just a question of how the information is represented. Now from the above table you are clear that how a 1TB hard drive has come finally to 931.3 GB. But how did we get the number Right sized capacity 827.8..This is called the checksum calculation which we will see it next. So a ITB hard disk leaves us with 827.8 GB of usable capacity so far. 1.Consider the hot sparing best practice. The customer wants to ensure that there will always be enough spares, so using the rule-of-thumb of 2 HDDs per 30 HDDs, 6 disks are set aside as hot spares. That leaves 94 HDDs from the initial 100 HDDs. 2.There is a root volume, rootvol, and it is recommended to put this into an aggregate of its own so that it gets maximum performance and availability. To standardize, the storage administrator configures 3 HDDs as 1 RAID group to create the rootvol aggregate, aggr0. Even though the total capacity used by the rootvol is just a few hundred GBs, it is not recommended to place data into rootvol. Of course, this situation cannot be avoided in most of the FAS2000 series, where a smaller HDDs count are sold and implemented. With 3 HDDs used up as rootvol, the customer now has 91 HDDs. 3.With 91 HDDs, and using the default RAID group size of 14, for the next aggregate of aggr1, the storage administrator can configure 6 x full RAID group of 14 HDDs (6 x 14 = 84) and 1 x partial RAID group of 7. (91/14 = 6 remainder 7). And 84 + 7 = 91 HDDs. 4.RAID-DP requires 2 disks per RAID group to be used as parity disks. Since there are a total of 7 RAID groups from the 91 HDDs, 14 HDDs are parity disks, leaving 77 HDDs as data disks. Deduct how many spares you plan to allocate. The number of spares you need varies based on the number of disk drives attached to your storage system. For a lower-end FAS200 or FAS2000 with a single shelf, one spare disk may suffice (configure two if you want to use Maintenance Center). On the FAS6080, with a maximum spindle count of 1,176 disks, more spare disks are needed to ensure maximum storage resiliency, especially with larger SATA disks that have longer reconstruction times. 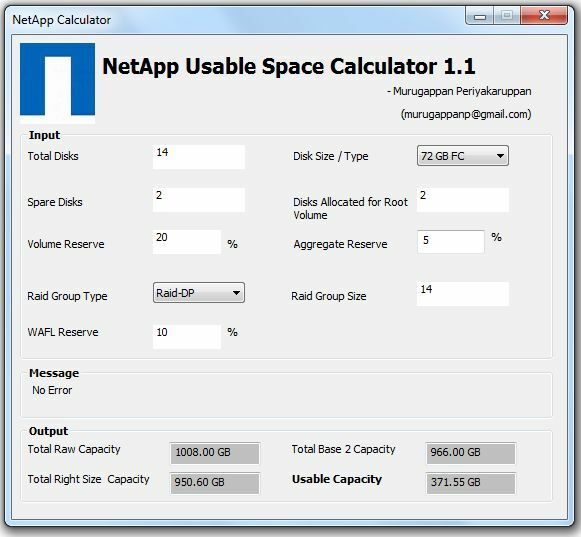 NetApp recommends using two spares per disk type for up to 100 disk drives, where disk type is determined by a unique interface type (FC, SATA, or SAS), capacity, and rotational speed. For instance, if you have a system with 28 300GB 15K FC disks and 28 144GB 15K FC disks, you should provide four spares: two of the 300GB capacity and two of the 144GB capacity. Root volume contains all configurations files (ONTAP Files). It is always preferred to separate the root volume from the data volumes on the filer. For optimal management, it is better to restrict the root volume to just 2 disks (minimum required for a RAID-4 parity group). This enables faster reconstruction times in case of a disk failure on the root volume. Deduct how many disks you have allocated for the root volume alone. Default snapshot space reserve is 20% of the volume size. This variable is set at the volume level and is set as a percentage of the volume. 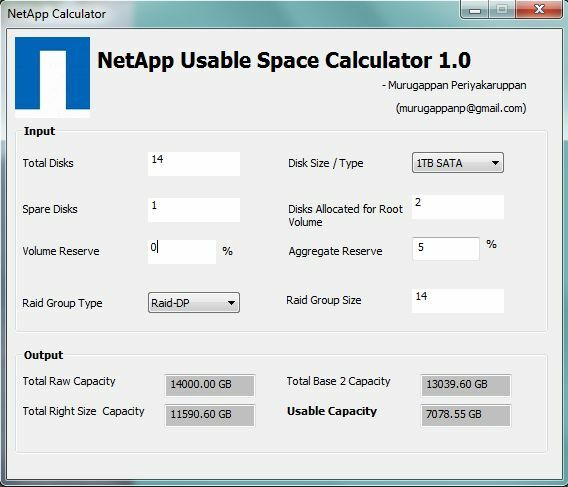 Data ONTAP removes the defined percentage of volume from being available for configuring LUNs or for file usage with CIFS or NFS. As Snapshot copies need space, they consume space in the snap reserve area. By default after the snap reserve area is filled, the Snapshot copies start to take space from the general volume. Aggregates are created by default with 5% reserve space. Some people leave this to 0 and set the reserve on the volume level.